The Sinquefield Cup is the third of four stops on the 2016 Grand Chess Tour (GCT) – a circuit of international chess events featuring the world’s elite chess talent, created in partnership between the CCSCSL, Chess Promotions, Ltd. (London Chess Classic) and the Kasparov Chess Foundation. The tournament is named after Dr. Jeanne and Rex Sinquefield, founders, founders of the CCSCSL. 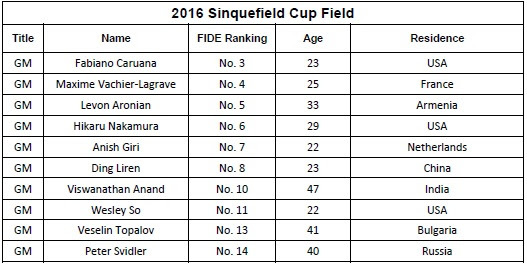 The 2016 Sinquefield Cup features ten of the top international chess players from eight different countries. Grandmaster Fabiano Caruana, now a Saint Louis resident, is entering the tournament with home field advantage after taking the U.S. Championship title at the CCSCSL in April. Another top-ranked American, GM Hikaru Nakamura, is coming off a noteworthy win, beating the No. 1 player and World Champion, Grandmaster Magnus Carlsen, for the first time ever this July. The third U.S. player ranked in the top ten, GM Wesley So, is coming back to Saint Louis as the U.S. Championship runner-up, and GM Levon Aronian from Armenia may be experiencing a career comeback, as the defending Sinquefield Cup champion returns to try and claim the title once again. In a recent field change, GM Vladimir Kramnik regretfully withdrew from the Sinquefield Cup due to health issues. The CCSCSL invited fellow Russian, GM Peter Svidler to replace Kramnik as the 10th participant in the tournament. GM Svidler is a seven-time Russian Champion, 2015 World Cup runner-up and participated in the 2016 Candidates tournament. The Sinquefield Cup is the final, major event held at the CCSCSL annually. 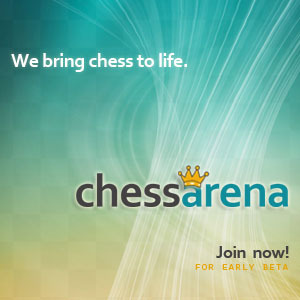 In addition to the Sinquefield Cup, the U.S. Championship, U.S. Women’s Championship and U.S. Junior Closed Championship – the “Triple Crown” of chess championships – make up the most prestigious chess tournaments held in the United States each year. The 2016 Sinquefield Cup will be streamed live daily on www.grandchesstour.org, featuring play-by-play and analysis from the world-renowned commentary team of GM Yasser Seirawan, GM Maurice Ashley, and WGM Jennifer Shahade. Live spectators may view the action in the tournament hall and enjoy additional GM-led commentary on-site. For more information, visit www.grandchesstour.org.